evajeanie and the sewing machiney: Bonnets on for Easter! and had fund painting some coloured pieces of card. Then I cut some cream felt and pink fabric for some ears, I also added a layer of pelmet vilene sandwiched in the middle to add some structure to the ears. I stitched around the pink layer with two layers of running stitch. Eva then cut out the eggs and chicks from the painted papers and added detail (her word - from Mr Maker apparently) with a fine liner pen and I stitched some yellow strips of paper around the brim for the nest and stuck on the decorations. I stitched the ears on with the sewing machine. 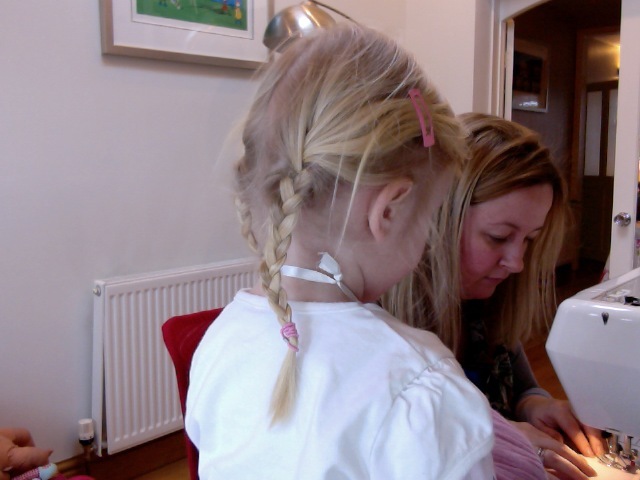 Last night once we had attached the under chin elastic, she was very excited! Throwing out my favoured theory of less is more I also stuck on some decorated eggs that Eva made at playschool and some small furry chicks, after she went to bed. However in the light of day, is this the saddest girl ever to wear an Easter Bonnet?! I am sure she'll cheer up when she finds her chocolate eggs. Happy Easter! !